After the success of the big art project We, Pig Country, which New Heroes developed for the province of West Flanders in 2012, several theaters requested to rerun the theatrical solo that was part of the project. When interest also arose from the Netherlands, and lead to a collaboration with ZLTO (an association for agricultural entrepreneurs), we decided to put We, Pig Country – the Solo on our repertoire for the next few years. The solo, written and performed by Lucas De Man in close collaboration with Johan Dehollander, tells about Stijn, a 30-year old boy that returns to his native country after travelling around the world for 12 years. His parents were pigfarmers, his brother has taken over the farm, he himself always wanted to be a knight. 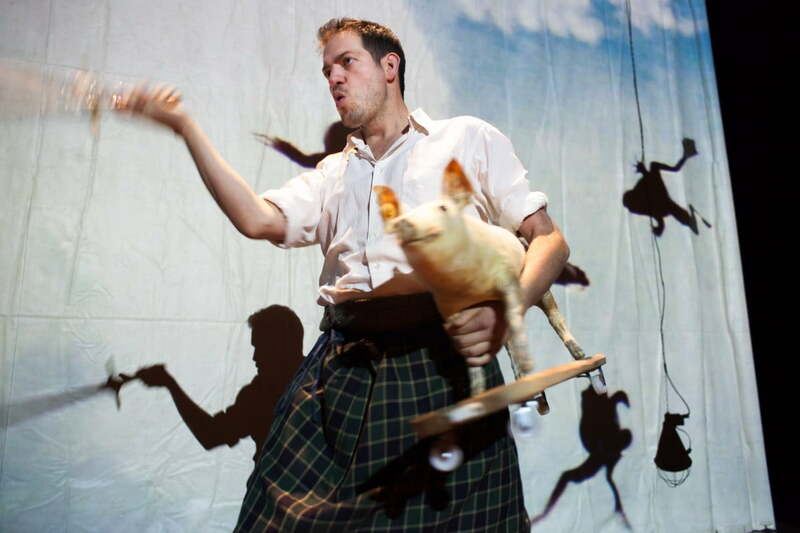 Lucas uses the pig and the pig world as a metaphor for our current changing world, and his quest for his own part in it. For this performance he did intensive research: he did internships at different pigfarms for a month, and interviewed grain traders, bankers, members of farmers associations, veterinarians and agricultural workers.